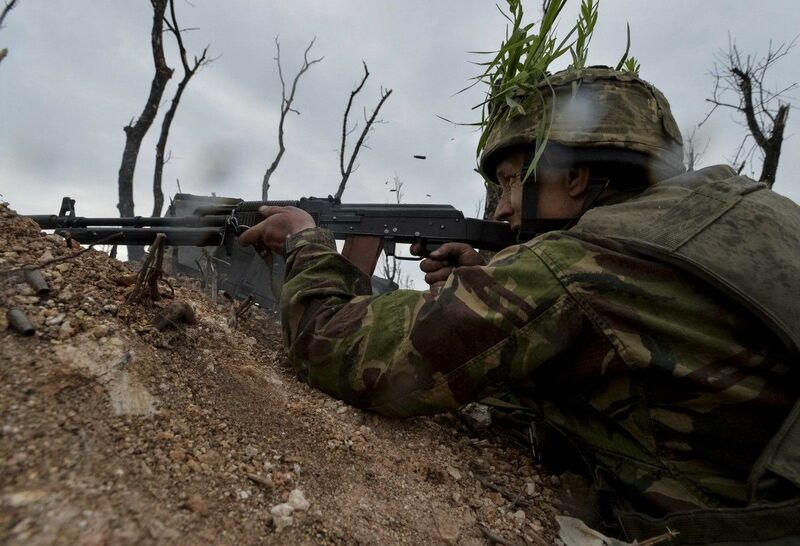 Ukraine's Anti-Terrorist Operation (ATO) Headquarters has reported that the situation in Donbas remains tense, as Russia's hybrid military forces have been shelling Ukrainian troops along the entire contact line; there were 35 attacks on ATO forces in total in the past day. "The enemy violated the ceasefire mostly after dark. In total, 35 armed provocations were recorded yesterday. Five attacks were mounted with the use of proscribed weapons," the ATO HQ wrote on Facebook on Thursday morning. Russian-backed illegal armed formations in the Mariupol sector attacked Ukrainian troops 14 times. However, there were no recorded instances when they used artillery systems whose caliber is over 100mm in the said sector in the morning or throughout the day. Read alsoContact Group agrees on "harvest ceasefire" in war-torn Donbas"The militants repeatedly opened fire on our strongholds near the villages of Vodiane, Hnutove, Talakivka, and the towns of Maryinka and Krasnohorivka, using grenade launchers and small arms of various calibers. ATO positions near the village of Starohnativka came under enemy 82mm mortar fire. Late in the evening they resorted to 120mm mortars to shell Ukrainian troops who have been defending positions near the village of Lebedynske," the ATO HQ said. The enemy attacked the Ukrainian army in the Donetsk sector six times over the period under review. Almost all the instances were recorded after dark. In particular, they used 125mm tank cannons to shell ATO positions near the villages of Kamianka and Opytne. Ukrainian positions near the village of Pisky, close to the ruined Donetsk airport, came under fire from grenade launchers, large-caliber machine guns and canons of infantry fighting vehicles. The fire was opened from the Russian-occupied town of Donetsk. What is more, grenade launchers of various models were twice used to shell the southern outskirts of the Ukrainian controlled town of Avdiyivka. The enemy fired large-caliber machine guns at Ukrainian troops stationed near the village of Zaitseve, close to the Russian-occupied town of Horlivka. Russia's proxies also violated the ceasefire in the Luhansk sector. "Having resorted to artillery systems near the villages of Krymske and Triokhizbeka in the morning and in the afternoon, illegal armed formations did not use proscribed weapons for the rest of the day. However, the villages of Troyitske and Novo-Oleksandrivka came under 82mm mortar fire. An anti-tank missile complex was engaged to shell our positions near Krymske. Our strongholds near the villages of Novozvanivka, Stanytsia Luhanska, Valuiske and Zhovte also came under enemy fire," the ATO HQ said. The enemy used mainly infantry weapons, and some of the positions were attacked by infantry fighting vehicles. "One Ukrainian serviceman was wounded in action amid enemy shelling in the past day. Another soldier sustained injuries," the update said.